Nicholas produces athletic offspring with tremendous athletic ability and jumping talent!! 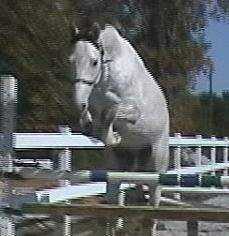 Aleksei is shown here free jumping for the second time ever. He shows outstanding form and enthusiasm for the task. He has recently been purchased by Anna & Rob Baldwin, of Winston-Salem, NC...congratulations, and good luck!! Nicholas x Daybreak...quite a Niche! 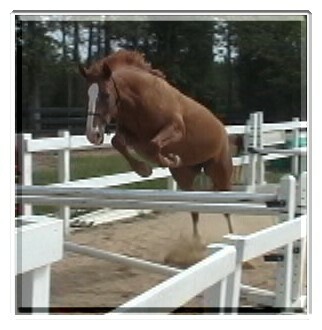 This filly can really do it well...first time free jumping! 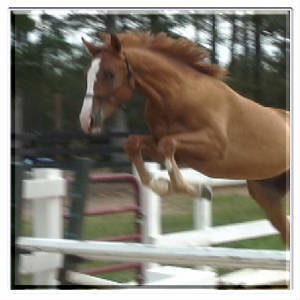 Catalina is a flashy filly with plenty of athleticism, and is a calm and cool individual. 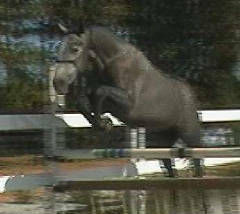 She is shown here free jumping for the second time in November of 2004. She is for sale, and would make a super fancy Junior Hunter. Please click here for more information! Super athlete with tremendous heart and ability! Cabaret is a super athlete with loose, flowing movement and plenty of suspension. 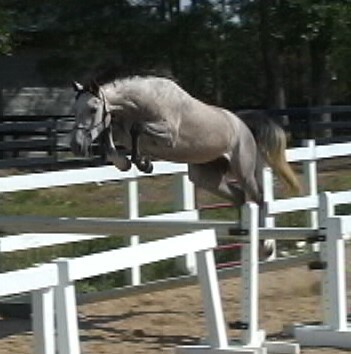 He is also an exceptionally talented jumper. He could do anything from Dressage to the big time Jumpers! He is for sale, and more information may be found by clicking here!